IDEA continues to expand support for J2EE application servers and has recently adopted the integration with OSGI-based Spring dmServer. If you like to try it out, first download dmServer from SpringSource download center (or use direct links for most recent 2.0.1 or older 1.0 releases — both supported in IDEA). Once server is here, you can register an installation in IDEA (Settings/Application Servers), which will recognize the version and load configuration properties from appropriate location. While registering a server, IDEA creates a corresponding OSGI framework instance which will drive the compilation of the code. Once the set of libraries is defined, it’s time to start coding! Support for dmServer 2.0-specific “plans” that serve the same purpose will be added in near future. Both local and remote servers are supported, in the latter case user may configure a ways to deliver the artifacts to remote server via “before run” task. If you’re interested please download the plugin and feel free to give your feedback at the forums or our bugtracker. This entry was posted in New Features and tagged dmServer, Spring. Bookmark the permalink. Nice to see IDEA support dm Server. So far deploying single bundles works fine but as we have already migrated to dm Server 2 with plans I hope that you’ll add support for plans soon. Thanks for this. I was waiting for dm Server support in IntelliJ. I am working on the plan’s support for 2.0 dmServer right now, please expect this feature to be added in a week or so. For the meantime, I would really appreciate some comments from you on the following topic which is not yet clear for me. 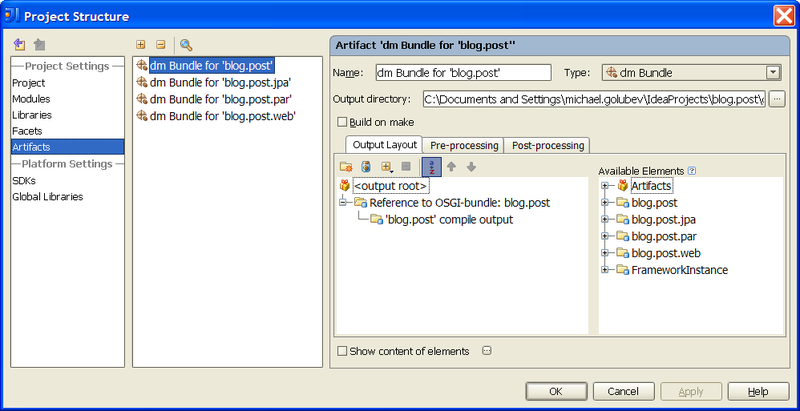 AFAIU, the plan’s deployment depends on the ability to push the set of artifacts (which constitutes the plan) into the bundle repository. Until now, for deployment we are using the JMX command pointing server to the local url of the prepared artifact, so deployment process right now is not affecting any files/folders under the server root folder. For supporting a plans we can either modify server configs by registering additional external bundles repository pointing to some location under IDEA project, or start to actually copy the plan’s bundles into the server (AFAIK, STS works this way). Each ways has some pros and cons so I would appreciate any thoughts from real dm practitioner on how to make it better. To my best knowledge, the only EPL code actually included into the IDEA plugin is the “com.springsource.server.management.remote-1.0.0.RELEASE.jar”. At the runtime, this jar is being internally deployed to dm server and participates in communication between IDEA plugin and server. This JAR is available at the https://anonsvn.springsource.org/svn/dm-server-tools/tags/2.3.0.RELEASE/com.springsource.server.ide.runtime.core/ and according to about.html in the same folder, had been made public under EPL by SpringSource (also I have no idea of where the sources for the code in this jar comes from). In IDEA this jar is used without any modifications and for the same purposes as original. Obviously the whole idea of dm server tooling as well as some of the concrete implementation had been influenced by the code from EPL dm-server-tools. However, I believe that all of the code in the actual state of IDEA plugin had been either written from scratch, or had been rewritten deeply enough to be not considered as a derivative. Thus, right now I am not going to publish plugin sources. 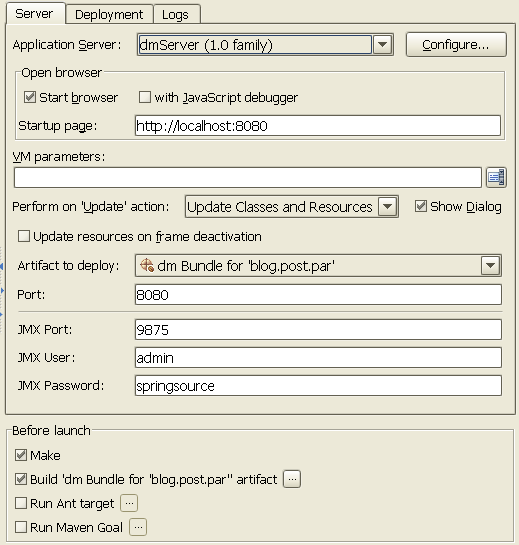 I will definitely include the note about the usage of the EPL covered “com.springsource.server.management.remote-1.0.0.RELEASE.jar” into the next plugin version, thanks for a good catch. Exception in thread “main” com.springsource.osgi.launcher.parser.ParseException: Config path ‘/Users/Eric/springsource/springsource-dm-server-2.0.1.RELEASE/”/Users/Eric/springsource/springsource-dm-server-2.0.1.RELEASE/lib/com.springsource.kernel.launch.properties”‘ does not exist. Obviously, something is munging the framework home with the -config property. I’m using this on a Mac, BTW, so I don’t know if this is an issue on Windows. I’m getting this too. Is there a fix or workaround for this? 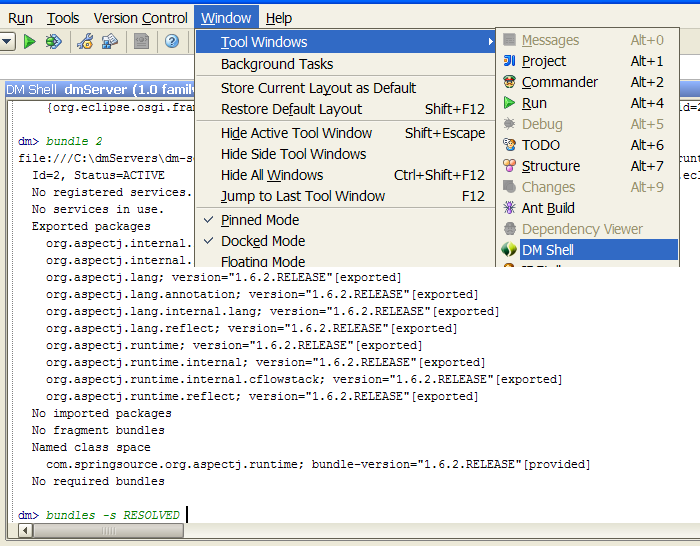 Guess something was lost in the transfer of dmServer from SpringSource to Eclipse? In order to use dmServer (Virgo) integration with IDEA 10.5(.1) you should download the latest version of the plugin — 0.9.6, which is available since today. Hmmm.. Tried the plugin and it is really buggy. I can’t manage to save a dm Server Plan, which, I believe, defines the artifact deployment order. Are there any other ways to configure the order in which my artifacts get deployed? There are a couple of fixed that haven’t got their ways to 10.5 release. All of them will be included into IDEA XI EAPs which will be published soon. Please add back support for DMServer in 2019, OSGi community and modularity is not dead and very much demanding.